Cut cauliflower into florets, place in a bowl and sprinkle with 1 teaspoon of salt. Set aside for 10 minutes. Then spread cauliflower on paper towel to dry. Combine flour, salt, and spices in a bowl. Make a well in the centre, add egg, gradually whisk in soda water until smooth. Cover and chill for 10 minutes. Put oil in saucepan or wok, heat to 170 °C. Put cauliflower into batter, stir to coat. Fry until golden brown. Using slotted spoon, spoon on the paper towel to drain. Sprinkle with salt and serve. 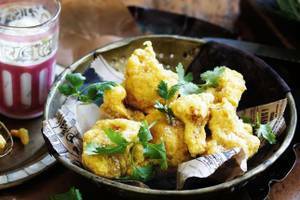 There are 443 calories in 1 serving of Cauliflower, Chickpea Flour Pakoras. Calorie Breakdown: 78% fat, 15% carbs, 7% prot.